Help us maintain the highest standard for the AFC® certification. This year the AFC® certification program celebrates 25 years of setting the standard for the field of financial counseling and education. One of the ways we uphold these standards is by conducting a job analysis survey. 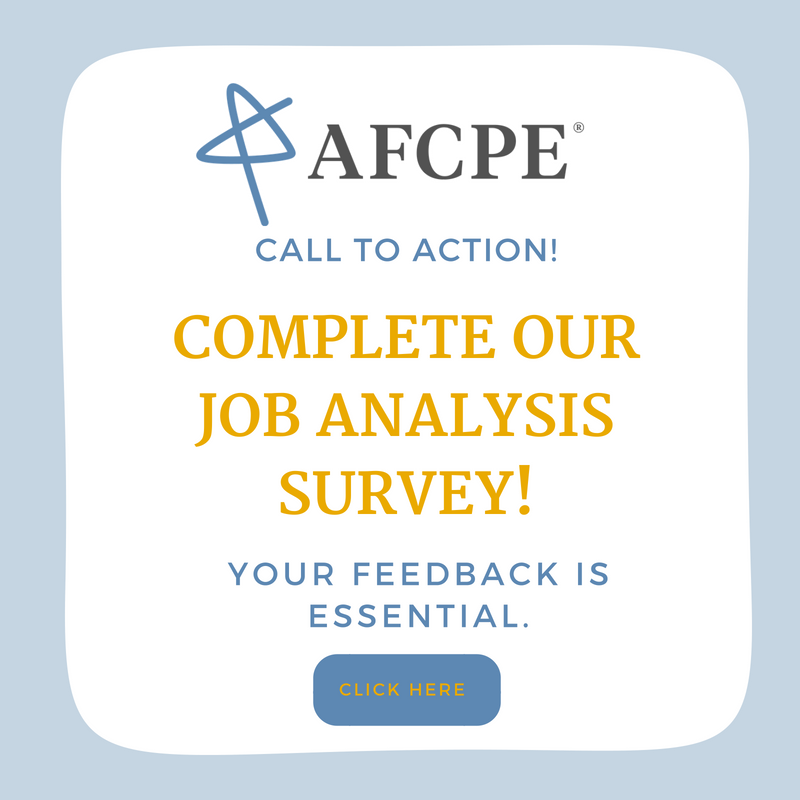 AFCPE conducts a job analysis every 4-years, working with a qualified psychometrician to make sure that the AFC®core competencies remain relevant to the work of that you do. We do this by putting together a comprehensive survey, or scientific inquiry, that allows us to gain a clear understanding of the role of financial counselors, coaches, and educators. The results of a job analysis ensure that a professional who passes the AFC® examination and completes the experiential and ethical requirements of the certification program can provide the highest standard of care to those whom they serve. It reiterates to the public that an AFC® has the knowledge, skills, and abilities to do their job effectively. Job analysis also allows the certification body to confirm the accuracy and validity of an exam and is critical to test development. Anyone who is working in the field as a financial educator, researcher, counselor or coach. If this describes you, we encourage you to participate! You do not need to be an AFC® to participate. Because your insights ensure that the AFC® remains the gold standard in the field. The job analysis process confirms that competencies tested through the AFC® exam are accurate, valid and reflective of the work that you do. The process and the results are critical in our continually evolving and fluid field. Personal finance is not one-size-fits-all. We want to continue to ensure that all AFC® professionals have obtained the best training to meet clients where they are and support them in achieving lasting financial wellbeing. In appreciation of your time and feedback, you will have the opportunity to enter your name and email into a drawing to win either a $250 gift card or a complimentary 2018 AFCPE Symposium registration. On August 6, 2018 we will one winner to receive a $250 Amazon gift card. However, the most important incentive is knowing that you are helping ensure that the AFC® certification mark continues to represent the highest standard for years to come!